Bill�s first planting was 2 � acres of Muller Thurgau, a medium sweet German grape variety that produced wine meant for drinking young. Before long Highfield�s plantings increased. Quite by accident, Bill and another local grape grower discovered some �rogue� grapes amongst the Muller Thurgau vines in the vineyard. Unsure as to just exactly what these infiltrators were, they took cuttings. The plants that subsequently grew proved to be none other than Sauvignon Blanc. The quality of the wine produced from these grapes encouraged the Walsh family to make and market wine under their own label. In 1990 the long-awaited opening of the Highfield winery took place and things took off. Soon after though, Bill decided to pursue a quieter life and began to look for a safe pair of hands to pass the winery on to. He ended up finding two pairs of hands in a Japanese fire fighting industrialist, Shin Yokoi and a Bristol business man, Tom Tenuwera. 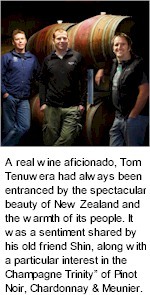 A real wine aficionado, Tom Tenuwera had always been entranced by the spectacular beauty of New Zealand and the warmth of its people. It was a sentiment shared by his old friend Shin, along with a particular interest in the �Champagne Trinity� of Pinot Noir, Pinot Meunier and Chardonnay. In 1991 Shin and Tom signed a purchase agreement for Highfield. Shin�s company was Champagne Drappier�s sole agent in Japan, and it was not long before he invited Michel Drappier, scion of the House of Drappier, to help guide Highfield�s M�thode Champenoise, Elstree Cuv�e Brut. The first Elstree made in 1993 won a gold medal at the National Wine Show of Australia in 1996. Success followed success with ensuing years earning gold medals and awards for the Elstree, Pinot Noir, Chardonnay and Sauvignon Blanc. Wairau is the Maori word meaning many waters, the name of the beautiful braided river that runs alongside Highfield's largest vineyard feeding life into the vines and influencing the style of the estate wines. Highfield wines from the Wairau Valley area typically have intense fruit aromatics and fine minerality. The Southern Valleys are fast becoming renowned for top quality Pinot Noir because of the heavier clay soils, drier climate and cooler temperatures than that of the lower Wairau Valley. Some of the best Highfield Pinot Noir is sourced at Mill Stream vineyard surrounding Highfield in the Omaka Valley. Papillon Vineyard in the Brancott Valley has plantings of Sauvignon Blanc and Pinot Noir. These gentle, north facing slopes see all day sun giving strong, bright flavours to the grapes and lovely clarity and structure to the wines. Both our Southern Valley Vineyards are farmed organically. From the outset, Shin and Tom have had high aspirations for Highfield, establishing Elstree Cuv�e Brut as their flagship wine. Wine writer Bob Campbell MW recently commented, Highfield�s Elstree Cuv�e Brut is impressive with a Champagne-like finesse and power. The talented winemaking team craft Highfield�s classic Marlborough wines with a commitment to consistency of quality and style. He traditionally makes a small and focused range of wines: Elstree Cuv�e Brut, Pinot Noir, Chardonnay, Sauvignon Blanc and Riesling.